If you are looking for information on the Microtel Inns & Suites franchise business opportunity, Microtel Inns franchises, Microtel Inns hotel franchising or Microtel Inn franchise information, then you have come to the right place. Microtel Inns & Suites is one of the fastest growing, all-new construction hotel franchise brands in the economy/budget segment and has established a reputation for customer satisfaction in the minds of travel consumers around the country. In fact, for the sixth (6th) consecutive year, J.D. Power and Associates has ranked Microtel Inns & Suites 'Highest in Guest Satisfaction Among Economy/Budget Hotel Chains' in its North America Hotel Guest Satisfaction StudySM. Microtel received the highest numerical score among economy/budget hotels in the proprietary J.D. Power and Associates 2002-2007 North America Hotel Guest Satisfaction Index StudySM. 2007 Study based responses from 47,634 guests measuring 14 economy/budget hotels and measures opinions of guests who stayed in a hotel between May 2006-June 2007. Proprietary study results are based on experiences and perceptions of consumers surveyed June 2006-June 2007. Your experiences may vary. Visit jdpower.com. Microtel has also received high marks in other prominent industry studies. The results of an important lodging survey conducted by the firm D.K. Shifflet & Associates ranked Microtel Inns & Suites #1 in the Budget and Economy segments. Microtel has also been selected as the Best Budget Hotel Chain for the annual Business Travel awards in Entrepreneur Magazine. Microtel's proven track record of successful development, strong operating performance and sustainable growth in the economy/budget market are what set us apart from the competition. 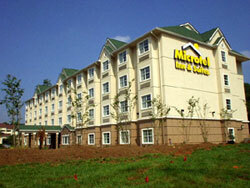 With 300 hotels open and 157 under development as of August 1, 2007, Microtel is well positioned for continued growth. If you are looking to build an economy/budget hotel, look into Microtel.